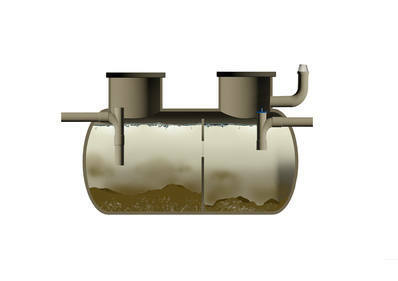 The FilterPod settlement tanks are 2 identical tanks which provide 2 stages of settlement for the solids to settle out. The second tank is fitted with a DrainX Filter to prevent small solids from exiting the tank. It is also possible to use an existing 2 chamber septic tank as the settlement tank. It needs to be the correct size and be watertight. In this case you would just order the FilterPod plant itself. You cannot use an 'onion' shaped septic tank as a settlement tank. The settlement tank is fitted with an effluent filter. The FilterPod settlement tanks are a sand backfill only on dry sites. They do not require a concrete surround for strength, only for ballast, if the water table ever gets higher than the base of the tanks. All the FilterPod tanks have a 10 year tank warranty when installed as per the installation manual (see DOWNLOADS below). We can also supply full drawings for you to build your own raw sewage settlement tank using concrete and blocks. This is useful for the Isle of Man and the Scottish Islands, where transportation of large tanks is expensive. As the FilterPod fits on pallets, they are relatively cheap to transport.